Welcome to the Zoey’s Attic Personalized Gifts $35 eGC Giveaway! Zoey’s Attic Personalized Gifts has items from Big Brother/Big Sister shirts to Back to School and Teacher shirts and gifts and everything in between! I don’t think it’s possible to not find what you may be looking for at Zoey’s Attic! You can read Mami’s 3 Little Monkeys full review of Zoey’s Attic and the Choo Choo Train Personalized Pillow Case and Kindergarten Rocks T-Shirt that they reviewed here. 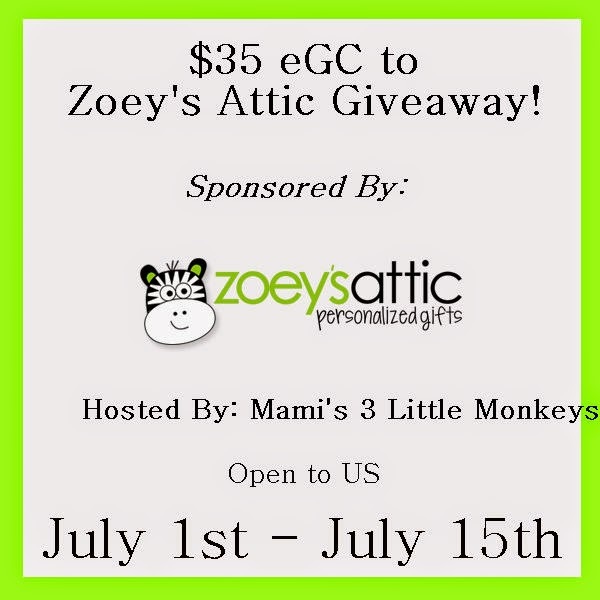 Enter for your chance to win a $35 eGC to Zoey’s Attic! Open to US residents whom are at least 18 years of age at the time of entrance. This giveaway will end on July 15th at 11:59pm CST. Winner’s entries will be verified, winner will be notified via email and will have 48 hours in which to respond or a new winner will be chosen. To enter, complete one, five or all of the entries that you wish in the Giveaway Tools entry form below. You do not have to complete all entries to be eligible, but the more entries you complete, the better chance you have of winning. Disclosure: Mami’s 3 Little Monkeys received the product found in the review in exchange for our honest review, we were not compensated in any other way for this giveaway nor are we or any other blogs participating in this giveaway responsible for the fulfillment of the giveaway prize.